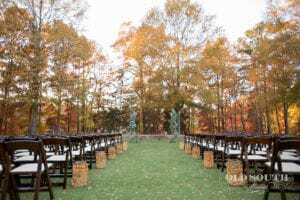 We each picked three wedding venues we like to work with to give you a few ideas on what to expect here in the Charlotte area! Enjoy! Finding a wedding venue is a monumental task. Once you have estimated your guest count, you have to check for availability. The aesthetic of your venue is also very important. You need to consider what kind of wedding you are looking at having, what location you would like to be, and how much you want to be able to customize. Some brides love barns and want a barn wedding, while others want to be in the heart of uptown, and still others wish to have luxury at their fingertips. There are so many beautiful venues in Charlotte. There are so many beautiful places in general 🙂 I wanted to highlight 3 venues that I love! 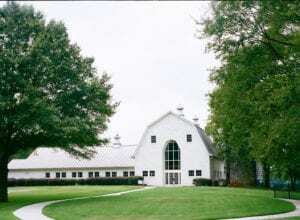 The dairy barn is a beautiful barn located in Fort Mill, South Carolina. It boasts a gorgeous wooden beam ceremony site upstairs with a beautiful view of the Anne Springs Close Greenway, the property on which the barn is located. Downstairs is a blank canvas for you to transform into your wedding style. The Dairy Barn was built in 1947 and has a beautiful outdoor patio. The Mint Museum Uptown is an amazing space. First, the museum has some beautiful artwork located inside. But the beauty does not stop there. The museum has gorgeous windows that allow ample natural light into the event spaces. The Mint Museum is a modern, bright, and lovely venue that showcases a balcony overlooking the city below. The Ballantyne Hotel and Lodge is located in southern Charlotte. The Hotel portion has a grand, glamorous inside with a gorgeous outdoor backdrop. There is elegance in every corner. The Lodge, right next door, has gorgeous views of the golf course and a more mountain-side retreat feel with the antiques located inside, the hunting décor items, and the wooden beams. Finding the perfect wedding venue for your big day is a monumental task, it sets the tone for your whole event and can really shape the overall feel of your wedding, no wonder why it feels so overwhelming! 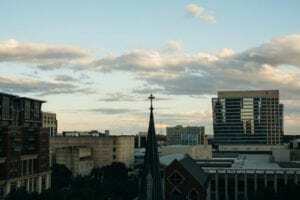 Today, I wanted to take a few moments to share with you the three Charlotte area venues I am currently obsessed with and maybe help you narrow down your options. The outdoor space at Ballantyne Country Club is truly breathtaking and ideal for the perfect outdoor wedding. A rustic wooden bridge leads the way to a circular ceremony space that is backdropped by stunning nature views. The ballroom is truly one to remember, most notable is a charming fireplace that makes the perfect backdrop for your head table. All in all the Ballantyne Country Club combines charm and elegance in a sophisticated way that serves as the perfect showcase for your big day. Located in the college community of Davidson, North Carolina, the Beaver Dam house is beauty personified. The historic white house built in 1849 brings rustic into the modern age. 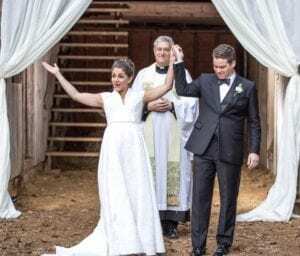 I am in love with the barn located in the back of the property which becomes the ideal romantic scenery for you ceremony. Guest than then move to the front of the estate to enjoy cocktails while taking in the past. Beaver Dam house makes the perfect something old for your wedding day. Longview Country Club can best be summed up with one word: Grand. From the stately brick exterior, to the spiral staircase and grand piano in the foyer Longview is breathtaking. The ballroom has a distinctive feel, with wooden beams, iron chandeliers, and a large stone fireplace which combine to create the perfect backdrop for your reception and a true upscale feel. The Charlotte City Club, located in Uptown, is a beautiful venue at the top of one of the many office towers in Charlotte. Each room has it’s own style and elegance, while giving you a beautiful view of the Queen City. Nathan Hoffman and his staff are wonderful and really go above and beyond to make sure your wedding is everything you dreamed of! 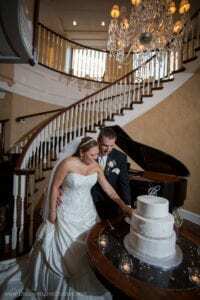 And that staircase, with the piano at the bottom, is the perfect place to stage your cake. 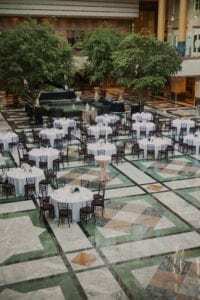 Founders Hall at Charles Towne Landing Historic Site, located in the middle of Uptown, is one of the biggest spaces in Charlotte, perfect for weddings with a high guest count. The unique ceiling provides so much natural light; you’re guaranteed beautiful wedding photos! The veranda above the reception area is the perfect spot to have an elegant ceremony, in front of the big windows overlooking the city streets. Founders Hall is definitely a one-of-a-kind beauty. Firethorne Country Club is located on a golf course in Waxhaw, NC. Ceremonies are held on the lawn around the back, with a beautiful altar. 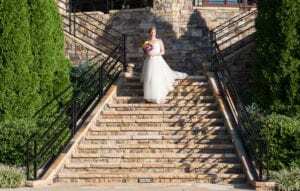 The stone staircase comes down from the reception area right to the ceremony, perfect pictures of the bride walking down the aisle to her groom. Hopefully, all of these local Charlotte wedding venues were helpful! Also here is a great article from Brides on how to choose the perfect wedding venue!